The online gambling industry is coming close to entering its official 20th year of existence. In the past two decades, a number of top companies have emerged that have really dominated the landscape of this industry. This includes a mix of older companies who got their start in online gambling in the late 1990s as well as companies that have come up a bit later on the scene. Whether they're a part of the new breed like Canada's own Amaya Gaming Group, or if they're a part of the old guard, all of the largest top ten businesses in this industry have been through a lot of interesting events. The third edition our the Top 10 was released in December 2017. For the latest up-to-date list, please visit our updated article. Since 1997, it has been known for focusing and producing high-class, high-profile online gambling sites. 888 Holdings has a focus on quality over quantity even though they cover every major type of Internet gambling company including bingo, poker, casino, sports and casual gaming. While they are number ten on this list, their overall worth is pretty big considering how relatively few sites they operate compared to some of the other holdings groups on this list. The big news for 888 Holdings has been a potential buyout in early 2015 by William Hill that completely fell through. William Hill was wanting to buy at a little over Â£2 per share while 888 held tightly to their own Â£3 per share evaluation. Neither side would budge through negotiations for several weeks (if not months), and that was the end of the deal. Bwin.party is the result of a major 2011 merge between PartyGaming and Bwin Interactive. PartyGaming started in 1997, and they dominated the online poker world in the number one spot before the passing of the UIGEA in 2006 which forced them to pull out of the United States in order to stay on the London Stock Exchange. They're currently operate the number three online poker room in the world behind Amaya's PokerStars and Full Tilt Poker. They also have an overwhelming sports betting product in continental Europe with Bwin. More recently, in 2014 Bwin.party was on the receiving end of a ton of criticism because of huge bonuses that were given to top executives while the company was going through a period of negative growth. About 30 percent of shareholders were against the bonuses after the market cap of the company had dropped by almost two-fifths during their time in power. We haven't had enough time to see if they've earned these bonuses, but they could fall off of the top ten list if something doesn't turn around. Betsson is the largest Swedish online gambling company who originally focused on B2B efforts before opening up in the B2C arena. This particular company was founded in 2000, but the company itself and the people backing it were working together since the 1960s. This means that they have a deceptively long history in the industry despite the Betsson name only being used since 2000. In the land of fixed-odds sports betting sites, Betfair (established in 2000) completely changed the game by putting in place a market where players could offer and accept each others wagers instead of having to deal with fixed-odds packages only. This has led to them being the largest betting exchange on the Internet. Generally seen as the biggest online gambling software provider by volume, Playtech's main characteristic that sets them apart is that they're well-known for their online casino game selection even though they tend to focus on other areas like bingo, sports betting and poker. Teddi Sagi formed the company in 1999, and after hitting the London Stock Exchange in early 2006 at a value of about Â£550 million, the passage of the UIGEA in the United States gave it an almost immediate drop of about 40 percent later that same year. In spite of this, they have continued to dominate the industry ever since. The Amaya Gaming Group is the largest Canadian online gambling company, and it's only surpassed in size by two of the biggest gambling brands in history. Unlike many companies on this list, they are an investment group which has purchased a number of major assets thought to be undervalued. So far, they've been proven right over and over again under the leadership of CEO David Baazov who has taken the company from small beginnings to its current status as one of the primary juggernauts in the online gambling world. Two major actions have really defined Amaya in its current state. The first was its 2012 purchase of CryptoLogic. CryptoLogic was once the largest online casino software provider in the world, but they ran into a lot of financial problems and lost their position because of poor leadership. Baazov targeted this company and purchased it to shore up their own online casino holdings. They were immediately in the green after restructuring, and they have remained profitable since. What really makes Amaya a big deal right now is that they are the center of the online poker world after purchasing PokerStars and Full Tilt Poker in 2014. Several billion dollars had to be raised for the purchase, and it helped to make Canada the biggest country in the world for online poker. The deal was so big that they are being investigated for their position on the Toronto Stock Exchange, but no charges have been filed as of the time of this writing. Known as the largest gambling company in Ireland, Paddy Power has made an exceptional name for themselves. Aside from providing excellent services, they've mostly done this through outrageous marketing campaigns that have gotten them into hot water more than once. The company itself was founded in 1988 when three bookmakers combined their shops under one name. They were then particularly aggressive about expanding to more betting shops in the late 1980s and early 1990s which gave them a foothold on the industry that they were able to parlay into a foothold on the online gambling world. Paddy Power has frequently been seen as the king of controversy. For example, when Barack Obama was elected as the President of the United States in late 2008, they offered a bet at 16:1 odds that he wouldn't finish his initial four-year term. Many people took this to believe they were offering a bet on Obama's assassination. They also offered odds on the first species to be made extinct as a result of the Deepwater Horizon oil spill in 2010 in the Gulf of Mexico. Did you hear about the most controversial ad campaign in the UK last year involving Oscar Pistorius? ...guess who?? The oldest company on this list is William Hill. They've been around since 1934, and the company is named after the founder William Hill who first started accepting bets thanks to a loophole he was able to exploit in the ban on gambling that existed in Britain at the time. What really sets this company apart is that they have been able to use decades of experience in the land-based gambling industry to define how they operate their online holdings. This experience edge has allowed them to dominate most of Europe in the realm of online betting. Being on top is not without controversy. A number of accounting irregularities were found in the late 1990s, and this caused them to be held under investigation by the Serious Fraud Office of Britain. This happened primarily during the sale of the company from Grand Metropolitan to Brent Walker, and it was mostly a matter of Grand Metropolitan lying about the profit levels to run up the price that Brent Walker was willing to pay. 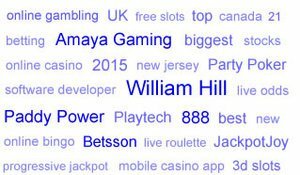 William Hill has also been accused of having members of parliament on the payroll, and they benefited a fair amount from new UK gambling tax structures that went into place in 2014 that forced out a lot of the smaller competition. What Sets These Gambling Companies Apart?